BackgroundCardiovascular disease is a frequent cause of death in peritoneal dialysis patients. Biocompatible peritoneal dialysis solutions with neutral pH have been anticipated to reduce cardiovascular disease more than conventional peritoneal dialysis solutions with low pH, but it remains unclear which factors at peritoneal dialysis initiation increase cardiovascular risk in patients using biocompatible peritoneal dialysis solutions. This study was undertaken to investigate which clinical factors at peritoneal dialysis initiation, including peritoneal transport status, are associated with cardiovascular event in patients using biocompatible peritoneal dialysis solution.MethodsThis retrospective cohort study of peritoneal dialysis patients using biocompatible solutions with neutral pH assessed relations of clinical parameters at peritoneal dialysis initiation to cardiovascular event during the subsequent five years.ResultsOf 102 patients who started peritoneal dialysis, cardiovascular event occurred in 18. Age, history of cardiovascular disease before peritoneal dialysis initiation, hemoglobin, serum albumin, C-reactive protein, peritoneal permeability defined by the ratio of dialysate to plasma creatinine concentration at 4 hr (D/Pcre) in peritoneal equilibration test (PET), number of patients in each PET category defined by D/Pcre, and peritoneal protein clearance significantly differed between patients with and without cardiovascular event. For patients divided according to PET category using Kaplan–Meier method, the group of high average to high peritoneal transporters exhibited significantly high incidence of cardiovascular event and mortality compared with the groups of low and low-average peritoneal transporters (Log rank; p = 0.0003 and 0.005, respectively). A Cox proportional hazards model showed independent association of PET category classification with cardiovascular event.ConclusionsPeritoneal permeability expressed as PET category at peritoneal dialysis initiation is an independent cardiovascular risk factor in peritoneal dialysis patients using biocompatible peritoneal dialysis solution with neutral pH. Greater peritoneal permeability at peritoneal dialysis initiation might reflect subclinical vascular disorders.Electronic supplementary materialThe online version of this article (doi:10.1186/1471-2369-15-173) contains supplementary material, which is available to authorized users. Cardiovascular and noncardiovascular mortality among patients starting dialysis. Cardiovascular mortality is considered the main cause of death in patients receiving dialysis and is 10 to 20 times higher in such patients than in the general population. To evaluate if high overall mortality in patients starting dialysis is a consequence of increased cardiovascular mortality risk only or whether noncardiovascular mortality is equally increased. Using data from between January 1, 1994, and January 1, 2007, age-stratified mortality in a European cohort of adults starting dialysis and receiving follow-up for a mean of 1.8 (SD, 1.1) years (European Renal Association-European Dialysis and Transplant Association [ERA-EDTA] Registry [N = 123,407]) was compared with the European general population (Eurostat). Cause of death was recorded by ERA-EDTA codes in patients and matching International Statistical Classification of Diseases, 10th Revision codes in the general population. Standardized cardiovascular and noncardiovascular mortality rates, their ratio, difference, and relative excess of cardiovascular over noncardiovascular mortality were calculated. Overall all-cause mortality rates in patients and the general population were 192 per 1000 person-years (95% confidence interval [CI], 190-193) and 12.055 per 1000 person-years (95% CI, 12.05-12.06), respectively. Cause of death was known for 90% of the patients and 99% of the general population. In patients, 16,654 deaths (39%) were cardiovascular and 21,654 (51%) were noncardiovascular. In the general population, 7,041,747 deaths (40%) were cardiovascular and 10,183,322 (58%) were noncardiovascular. Cardiovascular and noncardiovascular mortality rates in patients were respectively 38.1 per 1000 person-years (95% CI, 37.2-39.0) and 50.1 per 1000 person-years (95% CI, 48.9-51.2) higher than in the general population. On a relative scale, standardized cardiovascular and noncardiovascular mortality were respectively 8.8 (95% CI, 8.6-9.0) and 8.1 (95% CI, 7.9-8.3) times higher than in the general population. The ratio of these rates, ie, relative excess of cardiovascular over noncardiovascular mortality in patients starting dialysis compared with the general population, was 1.09 (95% CI, 1.06-1.12). Relative excess in a sensitivity analysis in which unknown/missing causes of death were regarded either as noncardiovascular or cardiovascular varied between 0.90 (95% CI, 0.88-0.93) and 1.39 (95% CI, 1.35-1.43). Patients starting dialysis have a generally increased risk of death that is not specifically caused by excess cardiovascular mortality. Increased peritoneal membrane transport is associated with decreased patient and technique survival for continuous peritoneal dialysis patients. The Canada-USA (CANUSA) Peritoneal Dialysis Study Group. The objective of this study was to evaluate the association of peritoneal membrane transport with technique and patient survival. In the Canada-USA prospective cohort study of adequacy of continuous ambulatory peritoneal dialysis (CAPD), a peritoneal equilibrium test (PET) was performed approximately 1 mo after initiation of dialysis; patients were defined as high (H), high average (HA), low average (LA), and low (L) transporters. The Cox proportional hazards method evaluated the association of technique and patient survival with independent variables (demographic and clinical variables, nutrition, adequacy, and transport status). Among 606 patients evaluated by PET, there were 41 L, 192 LA, 280 HA, and 93 H. The 2-yr technique survival probabilities were 94, 76, 72, and 68% for L, LA, HA, and H, respectively (P = 0.04). The 2-yr patient survival probabilities were 91, 80, 72, and 71% for L, LA, HA, and H, respectively (P = 0.11). 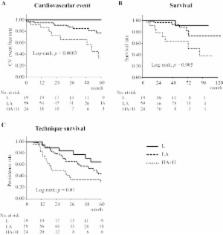 The 2-yr probabilities of both patient and technique survival were 86, 61, 52, and 48% for L, LA, HA, and H, respectively (P = 0.006). The relative risk of either technique failure or death, compared to L, was 2.54 for LA, 3.39 for HA, and 4.00 for H. The mean drain volumes (liters) in the PET were 2.53, 2.45, 2.33, and 2.16 for L, LA, HA, and H, respectively (P < 0.001). After 1 mo CAPD treatment, the mean 24-h drain volumes (liters) were 9.38, 8.93, 8.59, and 8.22 for L, LA, HA, and H, respectively (P < 0.001); the mean 24-h peritoneal albumin losses (g) were 3.1, 3.9, 4.3, and 5.6 for L, LA, HA, and H, respectively (P < 0.001). The mean serum albumin values (g/L) were 37.8, 36.2, 33.8, and 32.8 for L, LA, HA, and H, respectively (P < 0.001). Among CAPD patients, higher peritoneal transport is associated with increased risk of either technique failure or death. The decreased drain volume, increased albumin loss, and decreased serum albumin concentration suggest volume overload and malnutrition as mechanisms. Use of nocturnal cycling peritoneal dialysis should be considered in H and HA transporters. The Euro-Balance Trial: the effect of a new biocompatible peritoneal dialysis fluid (balance) on the peritoneal membrane. Although peritoneal dialysis (PD) is a widely accepted form of renal replacement therapy (RRT), concerns remain regarding the bioincompatible nature of standard PD fluid. In order to evaluate whether a newly formulated fluid of neutral pH, and containing low levels of glucose degradation products (GDP), resulted in improved in vivo biocompatibility, it was compared in a clinical study to a standard PD fluid. In a multicenter, open, randomized, prospective study with a crossover design and parallel arms, a conventional, acidic, lactate-buffered fluid (SPDF) was compared with a pH neutral, lactate-buffered, low GDP fluid (balance). Overnight effluent was collected and assayed for cancer antigen 125 (CA125), hyaluronic acid (HA), procollagen peptide (PICP), vascular endothelial growth factor (VEGF), and tumor necrosis factor alpha (TNFalpha). Serum samples were assayed for circulating advanced glycosylation end products (AGE), N(epsilon)-(carboxymethyl)lysine (CML), and imidazolone. Clinical end points were residual renal function (RRF), adequacy of dialysis, ultrafiltration, and peritoneal membrane function. Eighty-six patients were randomized to either group I starting with SPDF for 12 weeks (Phase I), then switching to "balance" for 12 weeks (Phase II), or group II, which was treated vice versa. Seventy-one patients completed the study with data suitable for entry into the per protocol analysis. Effluent and serum samples, together with peritoneal function tests and adequacy measurements, were undertaken at study centers on three occasions during the study: after the four-week run-in period, after Phase I, and again after Phase II. In patients treated with balance there were significantly higher effluent levels of CA125 and PICP in both arms of the study. Conversely, levels of HA were lower in patients exposed to balance, while there was no change in the levels of either VEGF or TNFalpha. Serum CML and imidazolone levels fell significantly in balance-treated patients. Renal urea and creatinine clearances were higher in both treatment arms after patients were exposed to balance. Urine volume was higher in patients exposed to balance. In contrast, peritoneal ultrafiltration was higher in patients on SPDF. When anuric patients were analyzed as a subgroup, there was no significant difference in peritoneal transport characteristics or in ultrafiltration on either fluid. There were no changes in peritonitis incidence on either solution. This study indicates that the use of balance, a neutral pH, low GDP fluid, is accompanied by a significant improvement in effluent markers of peritoneal membrane integrity and significantly decreased circulating AGE levels. Clinical parameters suggest an improvement in residual renal function on balance, with an accompanying decrease in peritoneal ultrafiltration. It would appear that balance solution results in an improvement in local peritoneal homeostasis, as well as having a positive impact on systemic parameters, including circulating AGE and residual renal function. This article is published under license to BioMed Central Ltd. This is an Open Access article distributed under the terms of the Creative Commons Attribution License ( http://creativecommons.org/licenses/by/4.0), which permits unrestricted use, distribution, and reproduction in any medium, provided the original work is properly credited. The Creative Commons Public Domain Dedication waiver ( http://creativecommons.org/publicdomain/zero/1.0/) applies to the data made available in this article, unless otherwise stated. Compatibility of insulin over 24 hours in standard and bicarbonate-based peritoneal dialysis solutions contained in bags made of different materials. Echocardiographic, electrocardiographic and blood pressure changes induced by icodextrin solution in diabetic patients on peritoneal dialysis. Influence of renin-angiotensin-aldosterone system-blocking drugs on peritoneal membrane in peritoneal dialysis patients.